The Coconut Grove community is fighting mad about a project that is planned for the small village's waterfront. They feel the city is selling out the property to the highest bidder and taking a small quaint area and turning into a mini waterside mall. A couple hundred residents showed up at a local bar on Wednesday night for the "Stop Grove Bay" kick-off rally. The objective was to collect money and to inform the public of the sham being perpetrated on the Coconut Grove waterfront by Grove Bay, the developers of the project, along with elected officials, who have plans for an over-sized project on the Scotty's Landing and Chart House space. The new oversized project is called "Grove Harbour." Speakers included activists Glenn Terry, Grace Solares and the man who started the campaign Charles Corda. Many neighbors were interested in knowing how the plan was changed or different from the original "Sisaki Waterfont Master Plan" for the area and they were given an earful from how the retail/restaurant space went from the original 6,000 to 7000 square feet of space to 100,000, to how we have a district commissioner Marc Sarnoff, who cares more about himself than what the voters want. And of course they spoke of the ever-changing garage which is separate from The Grove Bay (The Harbour) project, but none the less, important. The consensus is that the majority of Grovites are against the project, yet the commissioner and others are pushing the project through. There is a vote for or against the project on November 5, but for some reason, the city is pushing this project through. 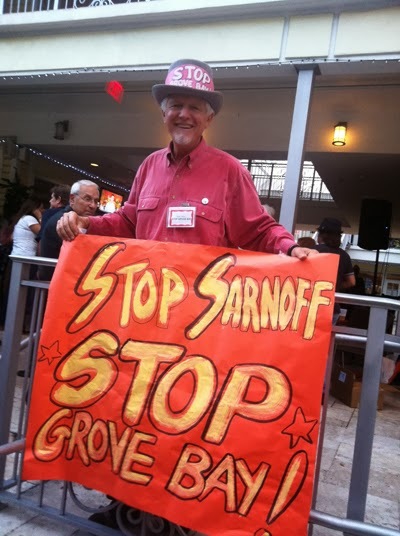 Knowing that the Grove residents are against it, they are now pushing the project on other neighborhoods in the City of Miami to get the approval vote, which makes Grovites suspicious. Why? One large aspect was the fact that the ballot question really does not address the issue and this may be cause for lawsuits. Another interesting aspect is that Grove Bay, who is building the project, can easily flip the project the next day if they care to. There is also mention in the plans of a casino, it only takes 3 votes on the City Commission for that. Shall the City be authorized to lease approximately 7 acres of waterfront and submerged lands in Coconut Grove to Grove Bay Investment Group, LLC, providing for 1) a minimum of $1.4 million in guaranteed annual rent and 2) approximately $17.9 million of privately funded improvements to redevelop an existing marina and public baywalk, construct restaurants and, partially fund a public parking garage for a 50 year term with two 15 year renewal options? This is not much for such a large and important project. It doesn't mention the exact area itself, it doesn't mention if a casino or 90-story high-rise can go in, it doesn't say much. It just asks if the City should hand the land over to a developer. Should they? Should the developer have carte blanche, which is what this vote is doing, giving them the authority to do whatever they please? Many present felt that people are not getting a clear understanding of the project. There have not been any real public meetings to discuss things and to get questions from the public. It makes sense to Vote NO on November 5, that is number 401 on the ballot. Why vote for something that is so shady? As for voting, if you are not going to be in town, you can get an "absentee ballot here." You can get more info on Stop Grove Bay "here."